Saluti! Join us for our new podcast, the Project Management Happy Hour! In our first 5 episodes, we are going to look at the first 5 questions you need to ask whenever starting a new project. Question 1 helped us define success for the project, Question 2 helped us understand scope and opportunity. Question 3 helped us understand budget and value. Now, we are going to look at what’s driving our schedule, and what to do when that goes all wrong. cover off the third – Schedule. Our schedule and work breakdown schedule is typically tied together because of the way we develop our schedules, often using Microsoft Project Client. The first part of our fourth question is: When does it need to be done? 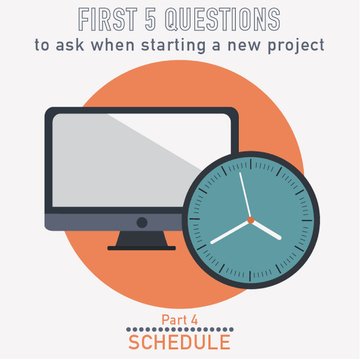 This is the first question we normally get whenever we start a project. After we get the date, we have to follow up with – Why? Because we would like to know if this is an arbitrary date or a hard date with dependencies. If it’s arbitrary, we want to find out if we have some flex in that schedule to help safeguard ourselves from risks, save money, and ensure additional quality. Project goals are great to drive your project with. But as any person who has worked overnight, long days, or delivered something less than satisfactory, we never let an arbitrary day drive our project. We always go back to our Why. The bottomline is we want to push things to get things done, but we do not want to give up some things that we don’t want to give up on. After getting the answer to the first two questions, we’ll jump into clarifying if the scope can be adjusted for time sensitive deliverables. done for the deadline or just some of the deliverables? If so, which ones? For example, we have a project with a goal of adding Spanish language support for our online password reset portal in time for the opening of our new office in Barcelona. If the project timeline is too aggressive to ensure quality success, we can clarify with our clients that the real goal is launch password reset service in Spanish. If it looks like the portal won’t be ready, let’s step back and assess the situation instead of trying to rush it and spend more money. It will make much more sense to make the process simple and hire temporary Spanish speakers for the helpdesk to handle the password reset while we give ourselves more time to work on the portal, ensure quality, and minimize risk. This goes back to our first question about success and using it to our advantage when we’re asking about schedule. What we want to happen is make the stakeholders realize the things that might be compromised for trying to push on their set date. process of creating your work break schedule or WBS. This includes estimating resources and durations, mapping interdependencies, and identifying critical path – all that great PMBOK stuff. schedule. Project managers are plan-based people. This is why we need to facilitate the project development first with our team, get their buy-in, input, comments, and their support when the plan is developed and ensure it is all realistic. Our job as a project manager is to protect our team and a lot of it is around schedule. “Rolling Wave” planning is a PMBOK concept that plays with the idea of Iterative Development. The goal is to develop the plan for the current phase in really good detail. Then proceed to the next phase at a higher level; just enough so you can plan and manage the project. Manageable Work Package is the component of work. When you plan your project plan, you’ll go down to a certain level of detail. Any deeper than this will not make sense to put in your project plan. The key here is you want to manage the inputs and outputs to the work package as oppose to every little step that goes into the task. When we look at our project as a whole, we want to do the work breakdown structure. Instead of wrapping your head around a complex project, we’ll look at it one piece at a time. We’ll breakdown the components until we get to the smallest part that makes sense to manage – the Work Package. Work with your team! This is the only way for you to have a realistic schedule. Don’t make it any more complex than it needs to be. The more complex the project is, the more important it is to set meaningful milestones along the way to track to. Right to Left Planning is an effective method that will be useful if your client gives a hard deadline which is sooner than the date you set for the project to be finished. The idea is for you to walk through your sponsor of what it means if you walk your way backwards. This is for them to realize that if they want the project done sooner, they could have started a month or so earlier. This has been discussed in our previous episode but let us reiterate the need to track the scheduled dependencies. There are processes that are out of your control and it is important that you hold the person assigned to this specific “out of control” task accountable. Document and communicate this dependency to the people in your project especially when the schedule is tight. Remember, you are the CEO of your projects. It is your responsibility to get stuff done. What is driving that date or deadline? What scope items specifically have to be delivered by that deadline? Which don’t? Do you know the what the dependencies are (internal and external) and when they are due? Do they know? Is this the right time to solve this problem? There is not a detailed schedule – and dependencies are not listed. You didn’t develop the schedule with people who are in the know. you would like to share – email us at Podcast@pmhappyhour.com or hit our Facebook page at PMHappyHour. You may also rate and post a comment for us on iTunes or on our site PMHappyHour.com. Your review will help us get the support we need to keep this podcast going.